You can make your own. I’m not sure some people know this. 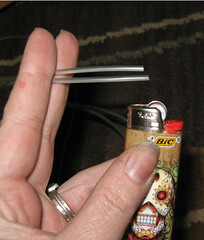 Rubber bands can be re melted and for the double drive cords, you can put a new one on. Possibly something that was in your stash. Let’s start with the rubber ones. You know they need replacing when they’re too loose to turn what they’re supposed to well (whorl or bobbin depending on the model you have). 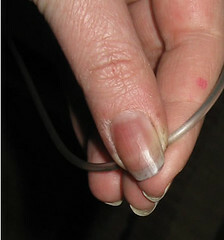 Take off the drive band so that it’s loose and you have control over it. If it’s a wheel that has to be taken apart to get it off off, just take it off the whorl or bobbin and the drive wheel so it’s slack. 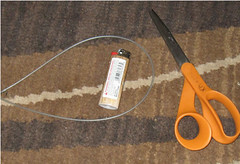 Get a pair of scissors and a lighter. Once the ends are heated, smash them together, but not too smashy. Once it cools slightly you’ll need to rub them together with your fingers or between pieces of wood or leather or something. Just a warning, if you use your fingers, you do risk getting burnt. Wait for it to cool and then you’re good to go. If you set up and start using it before it’s set then it will pull back apart. Give it a good 15 minutes or so. If you don’t have a drive band (ie, you got a used wheel and it needs a band) then you should contact a dealer for that specific wheel and buy one. 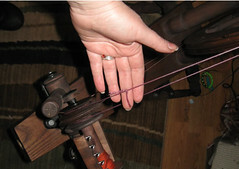 If your wheel is not in production any longer, you can make a tied cord band or you contact a reputable spinning shop and ask for a recommendation. Some currently marketed drive bands can be fitted to other wheels. There has also been rumored some success with lanyard stuff purchased at craft stores. I have not found anything that works as well yet. If you’re up for it, give it a shot but I can’t guarantee it will work. I’ll keep playing with things and if I find one that works, I’ll post about it. On to the string drive bands. 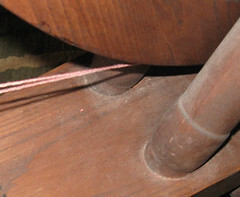 For a single drive wheel (think Scotch tension or Irish tension wheels) you just go around the wheel and whorl once and then tie the band (as I specified below). 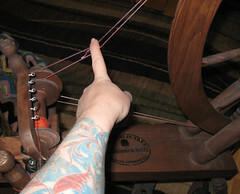 These can be a little difficult to get tight if you tie it while it’s attached to the wheel and the whorl. What’s best is to hold up the string around the whorl and drive wheel, mark where it would intersect to be tight (not crazy crazy tight, but taut), then pull it off the wheel and whorl, and tie it so it’s a nice snug fit. But what kind of cord do you want? Cotton, hemp, some kind of blend or my favorite is mercerized cotton. I prefer the cords to be DK weight. You can experiment to see what you like and what works best for you and your wheel. Just know that if the string you choose is too flimsy, it won’t last long. For a double drive wheel, loosen the tension. Basically bring the maiden closer to the wheel (tilt in or turn the screw depending on the type of wheel you have). Loosen the tension. This is so that once you tighten the drive band, when it stretches (and they usually do) you have room to tighten the tension. If you are just tightening an old band, cut out a section and tie. If it’s a new drive band, having a 3rd hand helps but you can do it. You will want to go around the whorl and wheel 2 times. Mark where they intersect to be taut, pull off the wheel and whorl, and then tie as specified below. This is hard to just show in photos and in writing. If you need help bring it to a reputable shop. You’ll have one cross. More than one cross and you’ve done something wrong, try again. You can see my one cross there below the drive wheel. This is my tie and here you can see the two strands, one going over the whorl and one over the bobbin. How exactly do you tie so that it doesn’t come loose? I use a variation of the Square knot and the Surgeon’s Knot Basically I tie the first part of the square knot, get ready to tie the second part of the square knot, only I put the string through a second time when making the second knot. Pull tight. This makes it a slightly bigger knot but super durable. All that’s really required is a square knot, I just like the extra security of doing it my way. This entry was posted in spinning, tutorial. Bookmark the permalink. My daughter and I just built a drive band for an Ashford kiwi using vinyl tubing, a zip tie, some gorilla glue and shrink tubing. The shrink tubing probably wasn’t necessary, but it kept the joint very smooth. 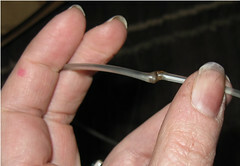 We cut the tubing to size and injected glue into both ends. We cut the locking end off the zip tie and pushed it into the glue filled tubing and then covered it with a small piece of shrink tubing which we heated to shrink using a hair dryer. It’s working well. thanks for this, my finger hurt is all better now cause when you drip that hot melty drive band stuff on, it hurts. Don’t be a goof like me. That was like Greek to me, but if/when I’m able to understand it, it looks like a great tutorial! And don’t worry about the dust/fingernails! Forgot to say you tutorial is great! It’s very clear and full of hope. We attempted our fix out of desperation, having just returned from MDS&W with new delicious roving, only to discover that the drive band from my daughter’s kiwi was missing. I think if your tutorial is a better solution than ours – simpler and fewer steps – thanks a lot! I bought a wheel at a flea market in France while on a camping trip. I was too impatient to wait till I got home to try spinning on it so made a drive band out of a spare tent guy line. One year on? Still working perfectly. Thank you! You just saved me $10 bucks or more!